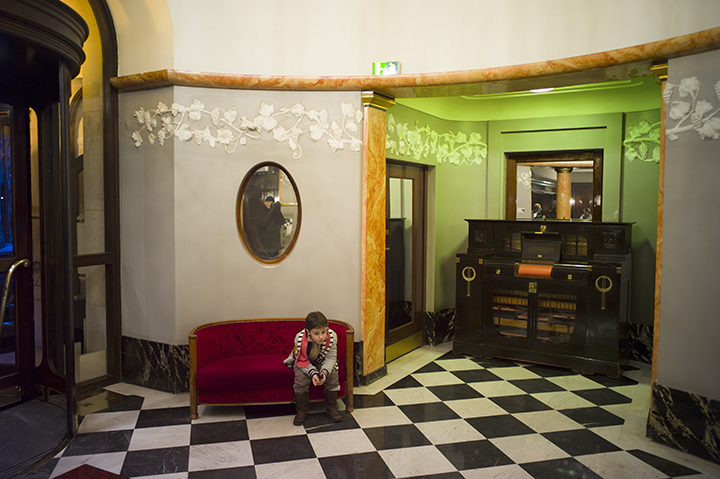 I came through the revolving doors into the warmth of the vestibule of the hotel, paused for a moment to take off my hat and gloves, and then caught sight of this kid sitting there like a little puppy waiting for his master. Something about the scale of the boy, and then the strangeness of the whole space; that room to the right, with the slightly underwater glow, and that crazy instrument from another era, circa 1900 I would guess, a piano roll, or reproducing piano I think it was called – look at the size of that thing! and think how far we have come and how we carry our music around with us today! But what was really happening, as it so often does, was that all of it suddenly filled me with a quickening of the pulse and the mind, which made me stop and really look at just where I was! Moments like that are expansive. Everything comes into play. I look all over the frame to make it register clearly, and out of that disciplined looking sometimes an interesting photograph comes. Back on the street I passed a cafe where a woman was drawing, and again an interior space made me stop. This time it was a more ambiguous space that caught my eye, but also the hard focus of the woman within, which made me take the moment and carry it off with me. It always astonishes me when themes arise, however loosely, on any given day, and connect disparate, non-events to each other, which then, sometimes, keep adding up. 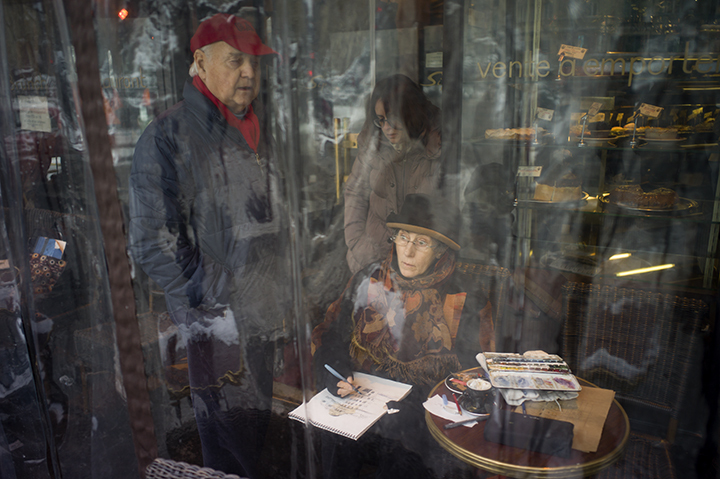 This entry was posted in Uncategorized and tagged cafe, Drawing, France, Hotel, Interior, Lutetia, portrait, restaurant, street, window on January 20, 2015 by joelmeyerowitz2014.